The Bluecoats drum line parades off the field at the conclusion of the 1988 DCI World Championship Finals held at Arrowhead Stadium in Kansas City, Mo. Just a second-year finalist at the time, the Bluecoats were relative newcomers to DCI's biggest competition of the year. Finishing in 11th place that summer, the corps was perhaps best remembered for its incredibly entertaining percussion solo during "Autumn Leaves." The corps used the favorite jazz standard as an opportunity to feature its snare drum section, whipping the audience into a frenzy while assembling a whopping 20-person line that stretched 15 yards across the front sideline. 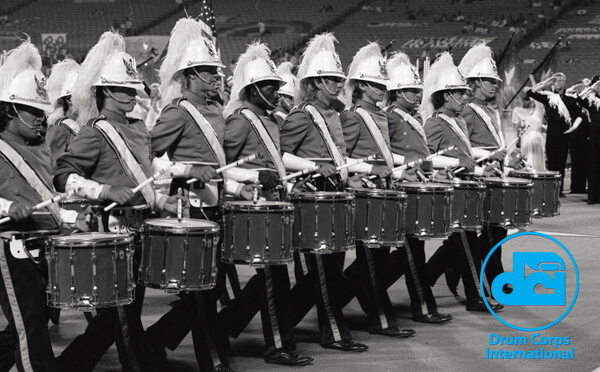 Read more about great percussion moments in DCI history. Photo from the Drum Corps World archives. Scanning and archival services provided by Drum Corps International corporate partner WeScanFiles.com.